AJJ (formerly known as Andrew Jackson Jihad) is an American folk punk band from Phoenix, Arizona, formed in 2004. The band has been noted for their lyricism, which often covers themes of social anxiety, poverty, humanity, religion, addiction, existentialism, and politics. Made up of singer/guitarist Sean Bonnette and bassist Ben Gallaty, the band has played host to many guest musicians from record to record. AJJ (formerly known as Andrew Jackson Jihad) was formed by Sean Bonnette, Ben Gallaty and drummer Justin James White, who left the band soon after. The band would record their first LP, Candy Cigarettes & Cap Guns, and release it on The Audioconfusion Manifesto label in 2005. They released a split LP with Ghost Mice on Plan-It-X-Records in 2007. Following this, Asian Man Records issued their second full-length album, People Who Can Eat People Are the Luckiest People in the World, on September 11, 2007. In 2009, the band's third record, Can't Maintain, was released by Asian Man Records. They toured the US with Kepi Ghoulie and Partners in 818, and had to say goodbye to their van, named Wolfenstein 3D: The Van. At this point, the band consisted of Bonnette, Gallaty, Deacon Batchelor on drums, and Preston Bryant on guitar and keyboards. 2011 had the band go on their second European tour. They also played festivals such as Plan-It-X Fest and the Asian Man Records 15th Anniversary. Mark Glick would also join the band, rounding out their sound with cello parts. The band's fourth full-length album, Knife Man, was released on September 20 by Asian Man Records and on cassette by Lauren Records. In support of this record, the band was a part of a full US tour with Frank Turner and Into It. Over It. 2012 was a busy year of extensive touring. In March, the band toured with Laura Stevenson and ROAR, which was quickly followed by another tour in April with Joyce Manor and Treasure Fleet. In September, the band did a short string of shows with Against Me! and Joyce Manor, followed by a full US tour with Future of the Left. 2013 saw yet another busy year for the band. In April, Bonnette went on a solo tour with Ian Graham of Cheap Girls. He also collaborated on a track with Sole that was released in May. In September, the band's first live album, "Live at the Crescent Ballroom", was released by Asian Man Records and on cassette by Lauren Records. In November, the band embarked on a west coast tour with The Gunshy. In June, the band had recorded a new album entitled Christmas Island with John Congleton and members of their full touring lineup Preston Bryant and Deacon Batchelor. The album was released on May 6, 2014 on Side One Dummy Records. In 2016, the band officially changed their name from "Andrew Jackson Jihad" to AJJ (a moniker that many of their fanbase had been using to refer to them for several years). In a statement on the band's website, Bonnette wrote "1.) We are not Muslims, and as such, it is disrespectful and irresponsible for us to use the word jihad in our band’s name. 2.) We no longer wish to be a living reminder of president Andrew Jackson. Interesting historical figure as he was, he was an odious person and our fascination with him has grown stale." On June 28, 2016, AJJ announced their 6th studio album, The Bible 2, along with a track list and pre-order bundles. The band also released a music video for the album's lead single, "Goodbye, Oh Goodbye." The clip is a style parody of the viral video approach to music videos made by the band OK Go. On August 1, 2016, the music video for "Junkie Church" was released. In 2017, the band released an EP on Lauren Records of new material entitled Back in the Jazz Coffin, consisting of acoustic songs. They also released Decade of Regression, a live album as a Record Store Day exclusive. In August 2017, after Chris Clavin of Plan-It-X and Ghost Mice was accused of being a sexual abuser, the band took all of their music off of the label and re-released it. ^ "A Jihad on All Sorts of Topics". Arizona Daily News, September 22, 2005. ^ AJJ Blog post: Big News Today Archived April 7, 2016, at the Wayback Machine. February 24, 2016. ^ 2006 Best of Phoenix Archived September 30, 2007, at the Wayback Machine. Phoenix New Times. ^ Album Review, Absolutepunk.net, October 3, 2007. ^ Queers, Lemuria, Bomb The Music Industry on Asian Man Tour Archived October 15, 2015, at the Wayback Machine Alternative Press, February 1, 2008. ^ Tour with Kepi Ghoulie and Partners in 818. AndrewJacksonJihad.com, November 24, 2009. ^  AndrewJacksonJihad.com, August 16, 2010. ^ Plan-It-X Fest sold out in 3 hours. PunkNews.org, November 24, 2010. ^ Asian Man to celebrate 15 years with history-spanning lineup. PunkNews.org, November 19, 2010. ^ "Asian Man Records". Asian Man Records. Archived from the original on September 13, 2011. Retrieved October 2, 2011. ^ "Andrew Jackson Jihad to Tour with Frank Turner" NationalUnderground.org, September 22, 2011. ^ Andrew Jackson Jihad announce tour with Laura Stevenson and the Cans, Roar. Yancey, Bryne. Alternative Press, January 30, 2012. ^ Andrew Jackson Jihad announce tour with Joyce Manor. Yancey, Bryne. Alternative Press, March 1, 2012. ^ Andrew Jackson Jihad to Tour With Against Me! ; No, They Aren't Playing Here. Woodbury, Jason P. "Phoenix New Times" magazine, July 5, 2012. ^ "Future of the Left touring w/ Andrew Jackson Jihad (dates); updated lineup for The Fest". Harrison, Caroline. Brooklyn Vegan, August 23, 2012. ^ Tours: Sean Bonnette (Andrew Jackson Jihad) / Ian Graham (Cheap Girls). Punknews.org, February 7, 2013. ^ Sole – “Civil War” w/ Ceschi Ramos, Sean Bonnette, Skyrider UGSMag, May 2, 2013. 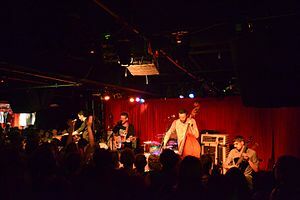 ^ ANDREW JACKSON JIHAD "Live at the Crescent Ballroom" LP Asian Man Records, September 3, 2013. ^ CincyPunk Fest, The Fest, November Tour with The Gunshy and Other Such Updates AndrewJacksonJihad.com, October 3, 2013. ^ Andrew Jackson Jihad (Official) Facebook page June 11, 2013. ^ "AJJ on Twitter". Twitter. Retrieved 2018-08-19. This page was last edited on 30 March 2019, at 06:27 (UTC).